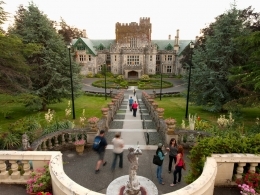 Royal Roads University provides high quality, innovative, competitively priced, and applied post-secondary education to working professionals and career-focused students in Canada and around the globe. The University has been accredited since 1995, but has got a long history of excellence that goes back to 1940, when it first became a military college. Royal Roads University offers a relevant and practical education to give you the tools, training, and understanding required to be successful in the global marketplace. In addition to the full-time on-campus programs, our Blended Learning model, online studies combined with intensive, on-campus residencies, is led by instructors with real-world experience and features course materials created with the input of industry professionals. But one of our biggest differences is our ability to bring likeminded professionals together so we can create a complex and effective learning experience. Programs delivered in Canada with opportunities to gain international experience during residencies abroad. Royal Roads University is located on the spectacular West Coast of Canada in Victoria, the capital city of British Columbia. Located on the southernmost tip of Vancouver Island, Victoria is just 25 minutes by air or 90 minutes by ferry from Vancouver, and less than 3 hours by ferry from Seattle. Located on 227 hectares of ocean-side parkland, with a hundred year old castle at its centre, Royal Roads is considered one of the most beautiful campuses in North America.